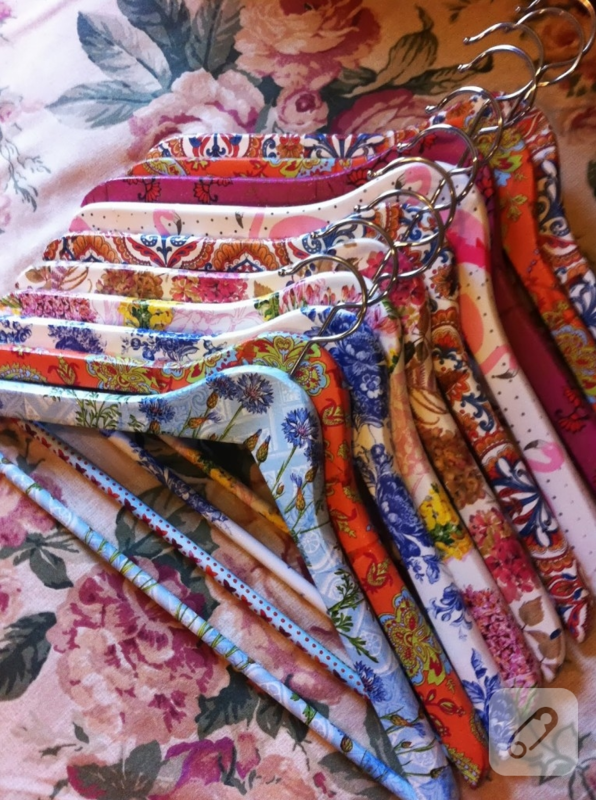 You’ll need classic wooden hangers. Besides these, you’ll use decoupage glue or Mod Podge, a wide crafts brushes, large napkins, sandpaper, acryclic craft paint and scissors of course. First, you need to separate the napkin. You’ll only need one layer. It’ll be very thin, so be careful and gentle. Sand the hangers carefully. Sanding gives the wooden objects a smooth an better surface for the upcoming applications. You can paint the hangers with 2 layers for a better result. Good idea to wait between layers for drying. You can always choose white or at least a very light colour. Then, cut out the parts you want to use. You’ll need large pieces to cover whole hanger. Flowers will look good. Brush a thin coat of decoupage on the hanger with your brush, then place your napkin pieces. Be careful and try not to have pots or air bubble voids. Then wipe your napkin gently with your brush. Be patient. Once dry, put one layer of glue or Mod Podge on top of it. Leave ’til completely dry. Then, repeat one or two more times. Now all you need is to allow your pieces to dry for a couple of hours, or a day to be exact. You can hang them, since they already are hangers!